With its’ curious blend of old and new, explore the bazaars discovering hidden treasures and negotiate your best price for a carpet surrounded by the smell of spice and coffee. Boasting 4,400 miles of coastline, it is no wonder Turkey is a sailors’ paradise. Chains of rugged mountains north, west, south and east frame a central plateau. 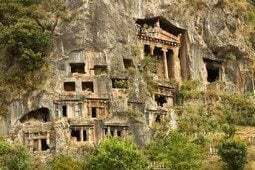 Turkeys’ culture and history is as diverse as its’ geography and climate making it one of the best sailing destinations in the Mediterranean. Dream Yacht Charters’ Turkish base is located at Ece Saray Marina in Fethiye, approximately 1 hour from the Dalaman airport. Ece Saray Marina has an excellent hotel, magnificent pool, bars and restaurants which serve unique tastes of Turkish and world cuisine. It also has a spa and wellness centre and hairdressers. 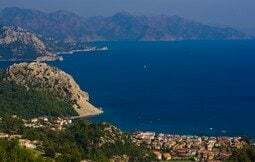 The marina is located on the eastern side of the Gulf of Fethiye, just in front of the town.Charters commence at 5pm on the first day and finish at 9am on the last day. The first and last night are spent in harbour, giving you the opportunity to explore the magical city of Fethiye. 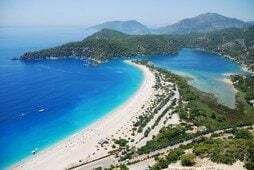 Charters run from Saturday to Saturday.Fethiye is a region known as both the Turkish Riviera and Turquoise Coast. Modern Fethiye is built on the ruins of the old city. Whilst there you can visit the beautiful Tomb of Amyntas, built by the Lycians in 350 B.C. The tomb is striking and the view of Fethiye and the entire bay is breathtaking.Our sailing itineraries can take you to Marmaris, where the Mediterranean and Aegean seas meet. The city is on a natural harbour surrounded by pine forests that stretch down to the waterfront. Marmaris, a stylish and cosmopolitan resort, is one of Turkeys’ premier vacation hubs with many restaurants and an excellent shopping bazaar.Pick ups and drop offs can be arranged from Marmaris, Bodrum and Gocek for a delivery fee and one way charters to the Greek Islands are also available.The best time of year to charter in Turkey is from April to November with temperatures ranging from 20c – 27c.